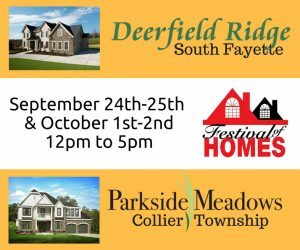 Make sure to visit Deerfield Ridge in South Fayette as part of the Pittsburgh Festival of Homes, a free event running September 24th and 25th and October 1st and 2nd, 2016. You can get a feeling for Deerfield Ridge’s scenic setting and spacious new home lots, as well as take a tour of our beautifully decorated model home. Our custom home consultant, Sonja Peters, will be on site to answer any of your questions about building a Paragon home that is uniquely yours. Festival hours are 12 p.m. to 5 p.m. all four days. Other members of the Paragon team will be on hand at Parkside Meadows, our new home neighborhood located in Collier Township, only four miles from Deerfield Ridge. Enjoy the Fall weather with a tour of both Paragon communities and a drive around the area to see all of the nearby restaurants, shopping and other amenities. For more information about Deerfield Ridge, click here. Visit the 2016 Festival of Homes Website by clicking here. 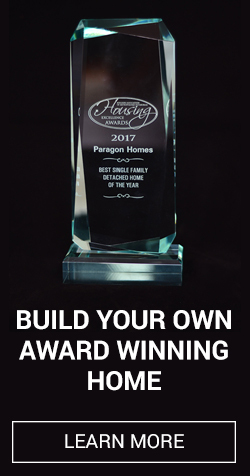 Paragon Homes is a custom homes builder specializing in custom built homes and new construction in the Pittsburgh and Allegheny County area since 1987. For almost 30 years, they have offered their clients outstanding service and exceptional value. The types of homes that they build span from villa-styled single-family homes to spacious luxury estates. Moving to Pittsburgh? Collier and South Fayette are a good bet! Notice: Plans, specifications, community amenities, standard features, availability and prices are subject to change without notice. Square footage calculations are made based on plan dimensions only and may vary from finished square footage of the home as built. Contact us for details. Copyright © 2019 Paragon Homes Inc. All Rights Reserved. Designed by Holt Web Design LLC.